Visiting Hong Kong during Christmas time is really a treat. Every corner of the territory will be oozing in lights, glitz, extravagant displays, holiday cheer, and... visitors. 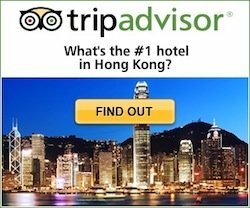 Hong Kong is a magnet to tourists during this season and booking your hotel as soon as possible is a must for best chances at better rates and availability. 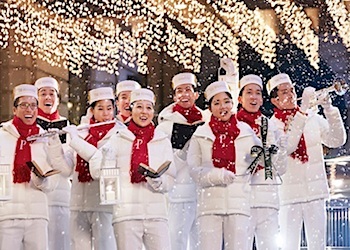 Hotels go all out for the celebrations with different themes and activities every year... christmas bazaars, live music and performances, activities for children, and naturally, fantastic displays, lights and decorations. 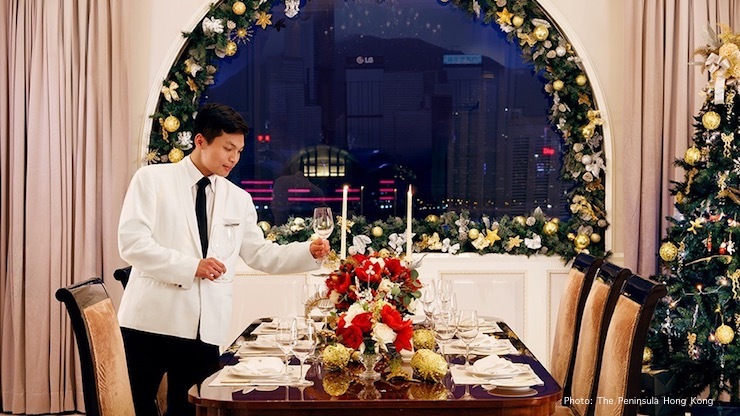 Here are some top hotels in Hong Kong and what they have on offer this Christmas: markets, christmas and holiday banquets, children activities, concerts and entertainment, etc. There is plenty to choose from whether you are celebrating with friends and/or family and children. Ritz Carlton Hong Kong is the world's highest hotel. Located between the 102nd and 118th floors of the ICC building, the tallest skyscraper in Hong Kong, it offers incredible views and panoramic surroundings of all the holiday glitz that envelopes the harbour this time of the year. Besides the killer views, the Ritz-Carlton unveils a sensational festive programme for guests to celebrate the holiday throughout their many venues including a Nutcracker Christmas Market in the lobby of the hotel, festive brunches and Teddy Bear afternoon tea, Christmas Eve and Christmas Day Dinners, Brunches, Buffets, Parties and more. All prices plus 10% service. Upper House is part of the "House Collection" of Swire Hotels, a handful of uniquely designed small luxury properties that strive to provide a distinctive and highly individualised experience. The hotel is located above Pacific Place, this is one of the top shopping centres that go all out with their Christmas decorations and programmes, you have fantastic views and easy access to world-class shopping and dining, the Admiralty MTR station, and the business district. 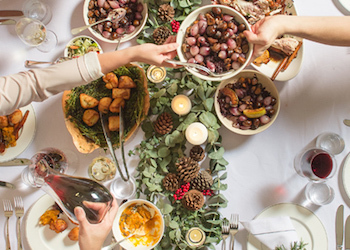 Upper House kicks off the celebrations this festive season with an elegant set menu at Café Gray Deluxe and a fabulous new family-style sharing menu where you can cosy-up fireside at the Sky Lounge. Wine pairing and vegetarian menu options also available. All prices subject to 10% service charge. The Pen is the legendary "Grande Dame of the Far East" and oldest hotel in Hong Kong. Located in the heart of Tsim Sha Tsui this hotel is perfectly situated for shopping and taking in the Christmas lights. Service at the Peninsula is over the top, and come holiday time, it won't dissapoint. The hotel's festive programme extends to each of the signature restaurants and bars, with a series of special menus to inspire magical seasonal moments. A Christmas Night Market will be held outdoors in the hotel forecourt on Christmas Eve Monday 24 December, 2018 from 6:00 pm to 8:00 pm, this European Christmas tradition will host festive stalls featuring traditional treats for hotel guests to enjoy. Complete with delicious celebratory menus and exclusive dining experiences, The Grande Dame's festive programme is set to dazzle this holiday season. All prices are subject to 10% service charge. Advance reservation is required. ›› Stay at the Peninsula, find best rates! Harbour Grand Hong Kong centrally located on Hong Kong Island, this multi-award-winning hotel boasts a 270-degree of the Victoria Harbour skyline. The hotel offers spacious guest rooms and suites suitable for both leisure and business travelers. The hotel is only 5 minutes walk from Fortress Hill MTR station. Surrounded by floor-to-ceiling windows on 3 sides, Le 188° Restaurant & Lounge offers a 188-degree harbour view from the very top of the hotel which is one of the best spots to enjoy the coolest moments of the year while savouring festive delights. The open terrace provide fabulous harbour and city views. 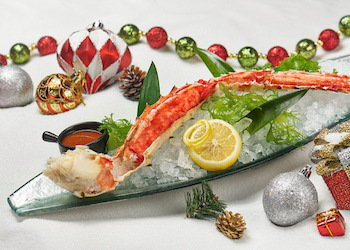 On Christmas Eve, a 6-course set dinner with live entertainment at Le 188° at HK$1,688 per person features Mango crab roll with amur river caviar and lobster jelly and the choice of main course includes Turbot fish meuniere or Slow cook beef short ribs. The menu ends with a traditional sweet of Strawberry & Raspberry mascarpone cheese with strawberry ice cream. To enhance the festive ambience, Champagne Package with canapés at HK$1,588 for 4 persons and HK$768 for 2 persons and Pinot Noir Package with canapés at HK$988 for 4 persons will be available at Le 188° on Christmas Eve, Christmas Day and New Year's Eve. 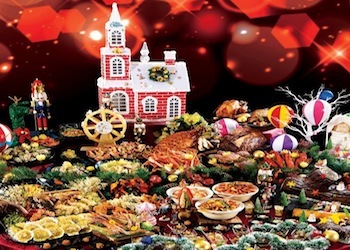 The festive programme extends to each of the signature restaurants at the Harbour Grand, with Lunch and Dinner buffet and set dinners on Christmas Eve and Christmas Day starting at HK388 per person. ›› Stay at the Harbour Grand Hong Kong, find best rates! 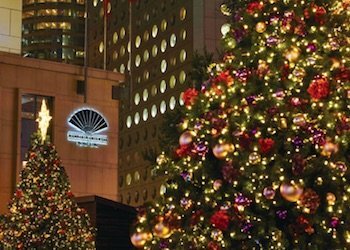 InterContinental Hong Kong, with its dramatic Kowloon waterfront location, always provides a spectacular setting for the holidays. Enjoy the breathtaking panoramic views of Hong Kong Island with its kaleidoscope of Christmas lights, as the dramatic backdrop for holiday dining in the five stylish restaurants and stunning Lobby Lounge. All prices subject to 10% service charge. Advance reservation is required. ›› Stay at the Intercontinental, find best rates this Christmas! The Marco Polo offers a fantastic location in Harbour City, Hong Kong's largest shopping center of legendary Christmas displays fame. The hotel also offers superb views of the world's most dramatic waterfront and is one of our top picks for fireworks viewing if you are staying through New Year's. For the holidays, get ready to unwrap a Christmas feast at Cucina with an Italian-style celebration, or spend an exhilarating night with the family at Cafe Marco which will be serving seasonal buffet specialties from around the globe, or simply book your table at the Lobby Lounge for a festive semi-buffet lunch or dinner. ›› Stay at the Marco Polo, find best rates now! The Mandarin is one of Hong Kong's legendary icons which opened in the early '60s. It enjoys that perfect location in the Central Business District and just steps from Statue Square where the city's Winterfest centrepiece stands every year. 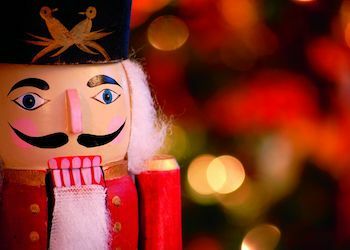 The Mandarin Oriental will certainly offer an unforgettable celebration of holiday cheer and festive glamour. 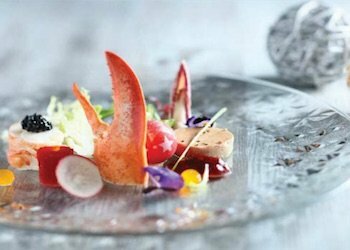 Their inspired festive menus offer traditional favourites alongside innovative treats, all prepared and served by an award-winning team. A long-standing tradition of freshly roasted chestnuts, warm mulled wine, and homemade mince pies is back this holiday season at the Hotel Lobby December 24 and 25, Roasted chestnuts at the Main Hotel Entrance and Chater Road from December 18 - 24, 2018. All prices subject to 10% service charge. Advance reservation and prepayment required for most. ›› Stay at the Mandarin Oriental, find best rates now! Best of This Holiday Season!